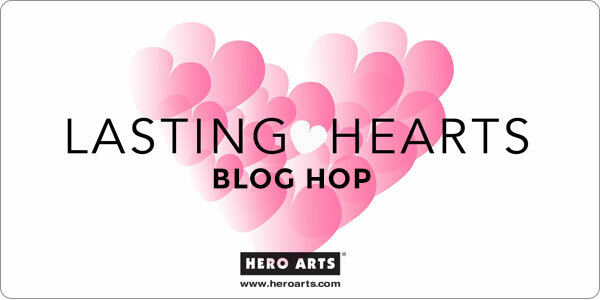 Hello and welcome to the Hero Arts Lasting Hearts blog hop. You should have arrived here by way of sweet & talented Amy Tsuruta's blog. If you didn't, head on back to the Hero Arts blog to begin at the very beginning. 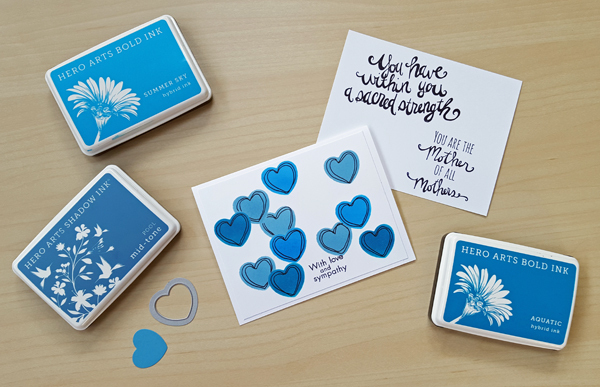 We're hopping today to tell you about three new products from Hero Arts, in support of Lasting Hearts. My friend and coworker Kimberly started this non-profit organization to assist mothers as they are going through unimaginable pain - the loss of a pregnancy. You can read Kimberly's heartbreaking story here. I am so amazed by her strength and her compassion to turn her own heartache into a cause to help so many other grieving mothers. 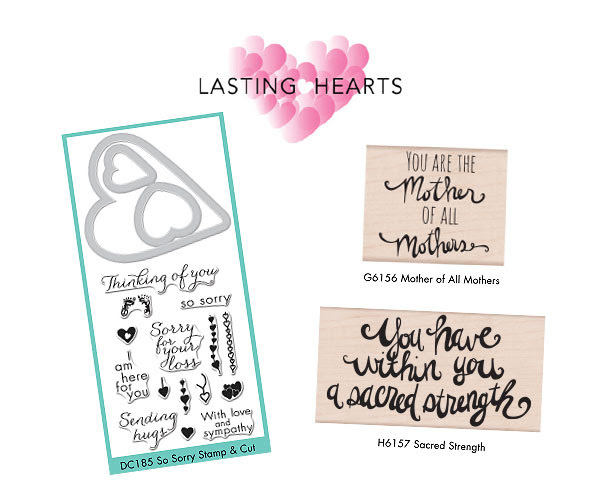 Hero Arts has three new products, with 25% of sales going to Lasting Hearts. The money will be used to provide the book "You Are The Mother of All Mothers" by Angela Miller to OB/GYN offices, to give to women who have suffered loss. For my first card, I used stamps from the So Sorry Stamp & Cut set, stamped in Crimson hybrid ink. The background is watercolored, and it's nice and flat for mailing. This next card uses the same So Sorry Stamp & Cut set. This time I created a heart stencil by die cutting with one of the dies. Then I sponged on Pool, Aquatic and Summer Sky ink. It needed a little extra something, so I took a black pen and doodled on the heart outlines. And now, let's get on with the hop! Next up is Yana Smakula, who I have no doubt has created something beautiful! The entire hop list is below - be sure to visit everyone and leave comments, Hero Arts is hosting a giveaway that will be drawn from all of the comments on all of the blogs! Beautiful cards and a wonderful cause! Thanks for sharing! Both designs are so pretty, Libby! I especially love your stenciled and doodled hearts! Two amazing cards. Love the uniqueness in both. I love both of the cards. 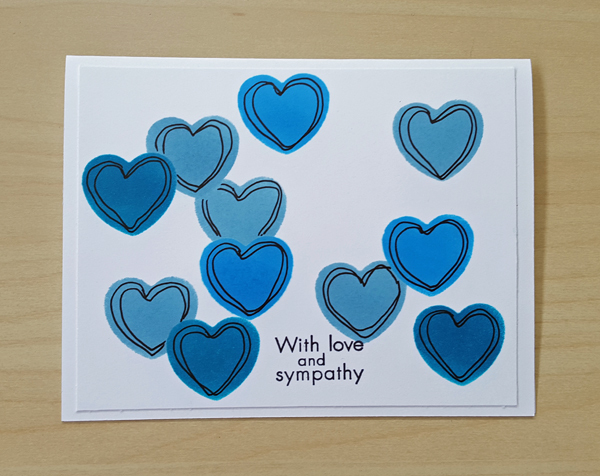 The blue hearts card is especially striking. Both so pretty, I especially love the dreamy background on the first one! The cards are beautiful! I like the idea that you made your own stencil and then followed it up with the doodle lines! Such beautiful cards! Thank you for sharing such a wonderful cause! Beautiful cards! I love the doodling on the second card! A precious pair of cards! Beautiful, touching cards. I am inspired to make another batch for the drive. Such sweet little cards. Just right for the cause. Thanks for sharing. Two very lovely and beautiful heartfelt cards!! Awesome card - can't wait to get my set! I think both cards are simply lovely. I like the black outline on the blue hearts it gives a bit more definition to the hearts and makes that blue pop! Beautiful cards! I am loving the bold ink colors. They make your cards really pop. Both of the cards a beautiful!!!! Love the cards. So sweet. So lovely! These stamps are a must. Lovely unique cards. Thanks for sharing. Heartfelt wishes for those who are grieving ... just right. Your cards are very kind and so sweet. Nice cards for this wonderful cause. Thanks for sharing! Both cards are absolutely fantastic! Both of these are lovely and original...just perfect! Pretty cards! Love the sentiments and the hearts! Beautiful card for a wonderful cause. Thanks for the inspiration. So beautiful! Especially love the softness on the pink card. Both of these cards are lovely! So pretty! 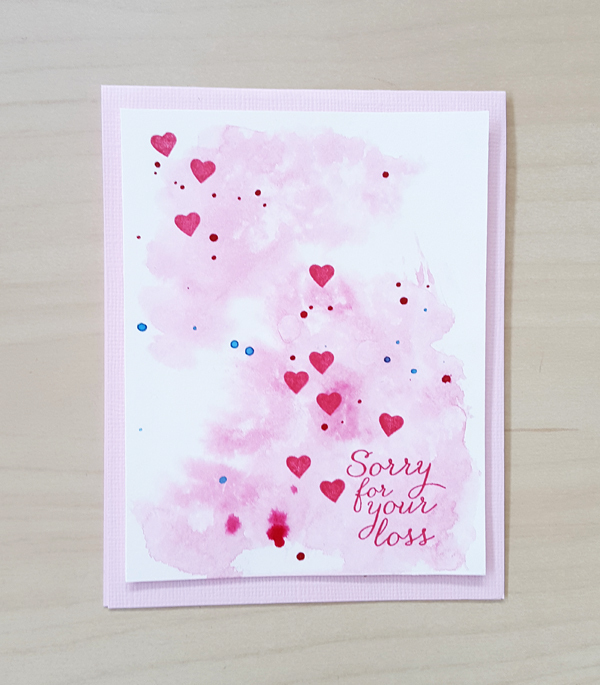 I love the water coloring on your first card with e hearts and then the blue on your second card is perfect for this sentiment. Very beautiful cards.. And love the campaign.. Thanks for your lovely cards. The doodling on the blue card added to its charm. Wow!!! What a lovely initiative!!! Your cards are amazing!!!! There are such pretty cards! I really like the doodling on the blue card. Such beautiful cards for a wonderful cause. Awesome cards!! I especially love your first with the cascading hearts!! Wonderful cards. I esp. like the doodle hearts over the stenciled ones. The watercolor card is so pretty - the colors go really well together. Watercolor cards are my favorite and is so pretty. Love your colors in both cards. Very beautiful and a needed cause. Love the cards! Thank you for sharing with us. Very nice cards Libby. I especially love the use of the watercolors on the pink card. Both cards are beautiful; the blue one is certainly enhanced by the outlines within the hearts. I really like the shades of blue. The doodling on the stencilled hearts really makes the card special! So sweet and simple. I am sure they will be encouraging. Lovely cause. I'm busy making cards with some friends to send in. Thank you for the inspiration. Great card. Love the watercolor effect. Very pretty card. Thanks for sharing with us. Both cards are lovely, Libby, and so appropriate for loss of girl or boy. 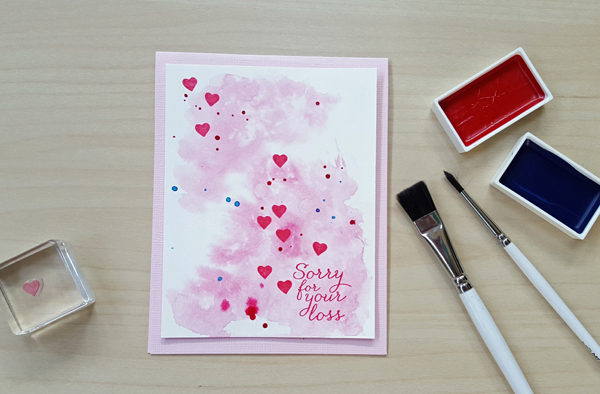 Especially adore the floating pink hearts on the watercolored background! I love both of your cards, Libby! The pink one is so sweet! Beautiful cards for a wonderful cause, Libby. Both of your cards are beautiful, but the pink one is my favorite! Both cards and lovely but the watercolor card is my favorite. I love the simplicity of both of them. Thanks for sharing.